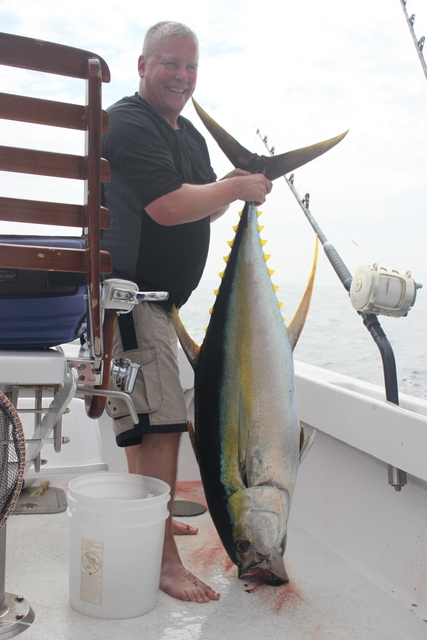 ← November 5 & 7, 2013 Dennis Returns For More Ahi! Jeff and Alan are both captains in Ketchikan, AK. Jeff runs a charter business there while Allan is a captain and chief of police! On day one fished a nice porpoise school that had a few fish in them. 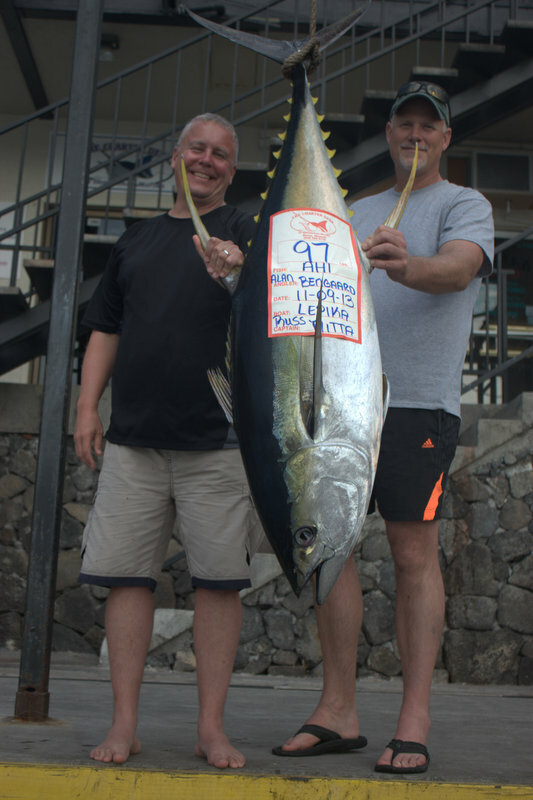 We got bit pretty quick and Allan landed his first ahi weighing 97lbs! We continued to work the porpoise just off the Kona Airport. We were marking fish and after a few more hours we missed a nice fish that completely missed our bait. As the porpoise neared the ledge we couldn’t get away from the Otaru (large skipjack tuna) that joined the pod. We would catch 3 otaru to 20lbs which the guys took home for dinner! I got a text from Jeff a few days later saying it was the best sashimi he had ever had, better than ahi! On day 2 the guys decided to bring the wives along! Again, we stuck with our plan to find the school we had fished the day before, but today was different. We had an unusually strong south wind that rolled in making the sea conditions rougher than normal. We did find a small porpoise school but it wasn’t holding fish. It was getting pretty uncomfortable so I headed in closer to shore to try for some ono. We made several passes up and down the ledge without a bite. At the end of the day as I was clearing the lines to go in the long corner snapped! 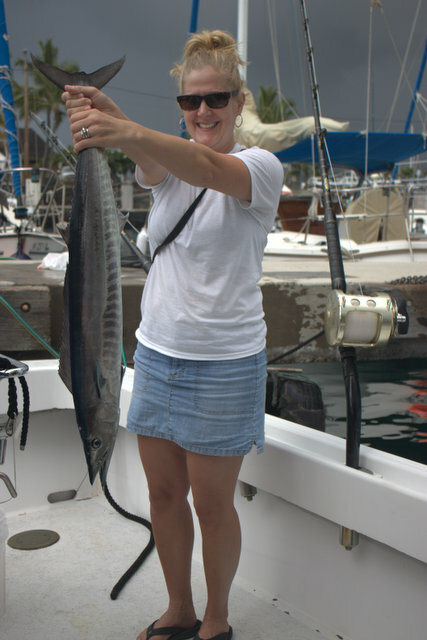 Nadra was up and fought her first ono (and dinner) to the boat! It wasn’t a huge one but they all eat the same!